Breakfast, we are told, is the most important meal of the day. During a detox your body will spend the night repairing and replenishing itself with renewed vigour, so when morning comes, although you might find yourself missing your usual favourites, a few new ideas will help you to prepare your body for the day ahead. Before breakfast, give your digestive system a boost with a cup of hot water containing the juice of half a lemon. Not only will you be relieving your body of its usual caffeine hit, but you’ll be helping to get your system moving, kick starting the cleansing process. If you like to start your day with fruit, why not whizz up some different fruits in a blender and make your own juices or smoothies? This is a great way to increase your vitamin and mineral intake, and you’ll create some fantastic recipes of your own using your favourite fruits. Buy organic produce to ensure you’re not adding the very toxins your detox is working to remove. On a cold day you might find that juices and smoothies just don’t do the trick. 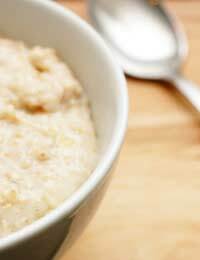 To warm your body from the inside out why not try porridge? If your detox diet bans milk, as most do, simply make your porridge with water and add to it any of your favourite fruits. If that’s not sweet enough for you, drizzle some organic honey over the top. Who said detox has to equal deprivation? Another winter warmer breakfast idea is baked apple. Simply remove the core and fill the inside with pieces of your favourite fruits. Try raisins for a traditional taste, or experiment with berries or anything else that tastes good. Making breakfast into a real occasion is a great way to keep you feeling satisfied throughout the morning. Turn a summer fruit salad into a breakfast for all seasons with the addition of some seasonal fruits. Summer will provide you with some beautiful ripe, juicy produce, but winter berries will also make for an antioxidant-packed breakfast on a cold morning. Staying faithful to regional, seasonal produce means your detox will be green in more ways than one. If you want to liven up a fruit salad or porridge, try sprinkling some seeds over the top of your breakfast. Ready mixed seeds are widely available and you’ll need just a sprinkling to boost your diet with essential fats. Try pumpkin, flax or sunflower seeds, and keep some with you to snack on throughout the day. Detox diets can feel very strict, leading many people to refuse to try one, or to abandon their plan after a couple of days. While it’s true that some of your favourite foods will be eliminated from your diet for the duration, try to view your diet as an opportunity to try new tastes, and experiment with different combinations. You might find that your old breakfast favourite gets banished for good!